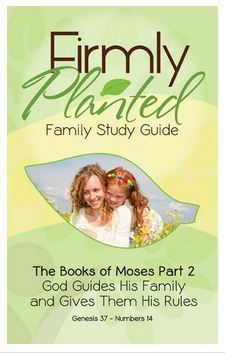 Now featuring another non-curriculum review-- I'm delighted to share about this book from Real Life Press. This paperback seemed to be written just for me. 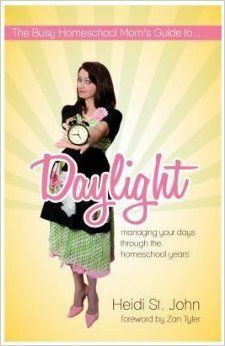 The Busy Homeschool Mom's Guide to Daylight: managing your days through the homeschool years by Heidi St. John is an easy to read and applicable book of advice for homeschooling moms. Her pointy toed high heel shoes (which I can't push my toes into much less wear) on the cover at first reminded me of my big sister. After starting to read her advice, the whole book had that big-sis advice quality. She has been homeschooling for longer than my oldest child has been alive, yet Heidi also has younger children than my youngest. That means she has loads of experience, but she is still in-the-trenches, so to speak. I'm a planner, but I also fill my time with less essential demands by not planning enough. I'm not typically a scheduler in terms of writing out my plans for the day hour by hour, though I have in my head an idea of what I want to accomplish. Heidi encouraged moms to make a schedule to help us maintain our focus, and then she shared a variety of vastly different schedules for examples. Then she discussed one of my tenets--flexibility. Having a schedule doesn't mean we have to legalistically stick to it to the point of driving everyone in the house crazy. 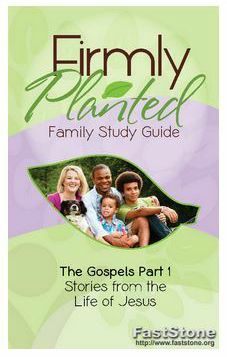 "When our children are grown, what do you want them to remember about their homeschool days?... (not a) harried, stressed-out mom who was not much more fun than a math assignment." So I did it. I started with a list of what we most needed to accomplish, then I penciled things in for the rest of our week. Then I took it a step further and made a meal plan. I'd been loosely sticking to a healthier fruit and veggie filled plan recommended by a friend, so I added our main family meals to it and incorporated that into our new schedule along with when specific children would help with specific meals. Does that sound simple or complicated to you? I have contemplated something similar for a long time and attempted schedules in different ways through the years, but this one seems to be on target for our current needs. 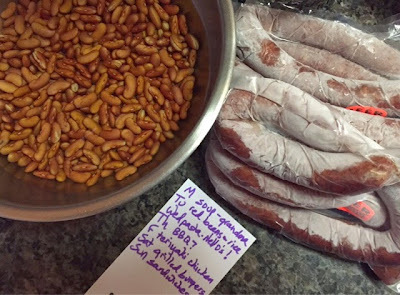 Meal planning in action: Monday--red beans soaking, Monday night--sausage thawing, Tuesday--red beans in crock pot before friends visit for tea so Tuesday night--dinner is simple to complete after a busy day. That's just one meal (well, leftovers for lunch later, too) but planning ahead meant the necessary steps got done ahead of time to help get us around the table for one of our favorite meals last Tuesday night. 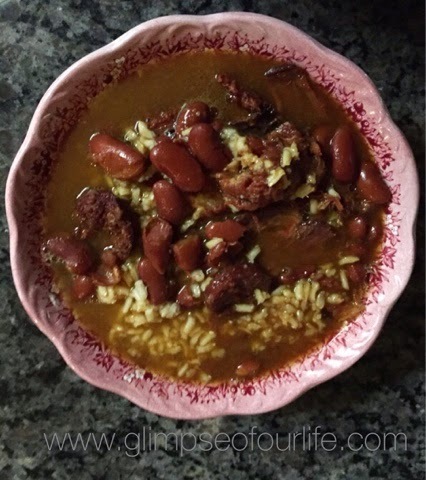 I see the value in meal planning and now have two successful weeks of this behind me! It didn't take nearly as long as I had anticipated, either. Our current week's meal plan is based primarily around the chicken and pork chops that I found on sale during my most recent grocery shopping trip. We have recently dealt with a few extra situations that required that aforementioned flexibility. Our wireless internet stopped last month which meant that only one person at a time could work on an online lesson. The schedule helped us with this a lot. Another adjustment was my inlaws visiting. They just headed to another son's house, but while here they have their camper set up in our yard. The kids naturally want to spend as much time with them as possible. Heidi's book mentioned that parents live with them. The grandparents are even built into the schedule that she shared such as breakfast prep with Grandma. We lived with my parents for about a year while my husband built our house, and I wonder if things would have been smoother with this type of scheduling back then. Some things with my inlaws are scheduled like when I need to have the washing machine free for them. With our new schedule, since they were here for a few weeks, I included them in my planning. Moving forward, though, I'll share how this schedule worked for us. Like Heidi, I've found it much easier when I group as many lessons as possible for all three children. My junior is mostly independent, yet she joins us for art, computer tasks, and is a huge help in teaching her younger siblings. My middle child also helps teach my son. And my youngest, my son, wants to do most things his sisters do. I've learned that he thrives when given responsibility, and I even allow him to teach the rest of us at times which is just a kid friendly description of narration. Did you notice the sweet photos shared over the weekend of the new princess, especially her flawless mom walking down steps in heels while waving, smiling, and showing off her new baby eleven hours after giving birth? I looked nothing like that a few hours after the birth of my second child. One lesson I've had to take to heart as a homeschool mom is not comparing myself, my home, and my kids to other homeschool families. It is so easy to fall into that trap. This isn't an advice book that made me feel like I couldn't ever measure up. Instead, I found the practical suggestions inspiring. One of the concepts that most stuck with me from this book is the author's advice for more of what she calls white space. Her gentle recommendation is for way more unscheduled time (hence the term white space) on our calendars. We lead a busy life, and homeschool does not mean we always spend typical school hours at home. But when we do, it is refreshing. Homeschool field trips, classes, adult classes that the kids are invited to, music lessons...our days are full. I crave that white space though and am working toward actively planning for more of it. 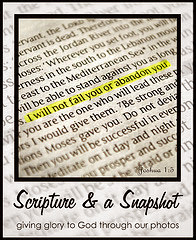 Click the graphic below to read other Schoolhouse Crew Reviews of this and other books by Heidi St. John from Real Life Press. 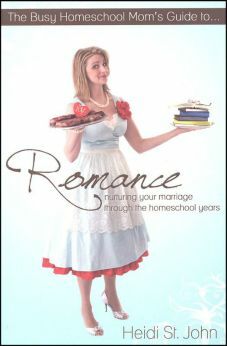 Every now and then I read a book that I want to share with every other homeschooling mom that I know. This is one of those books. 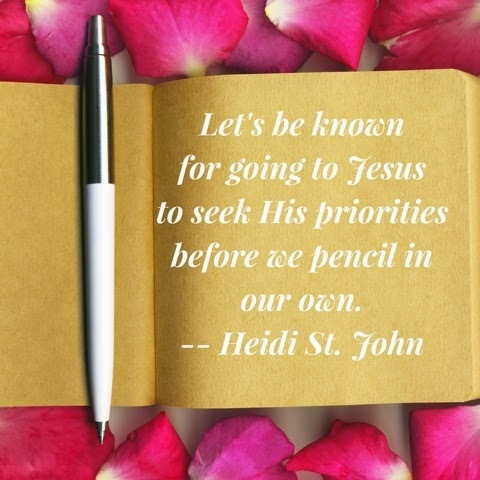 The down to earth common sense advice shared by Heidi has helped me to refocus on my true priorities. 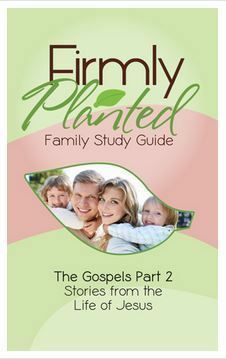 Right now you can subscribe to her blog and read a chapter for free. If you read it too, come back and let me know what you think.